Quaker Tapestry Museum is very close to Kendal town centre. Just 2 minutes walk from the bus and 6 minutes walk from the train stations. Step-free access to the building is via the Stramongate entrance. Why not cycle here? There's plenty of safe places to leave your bike. 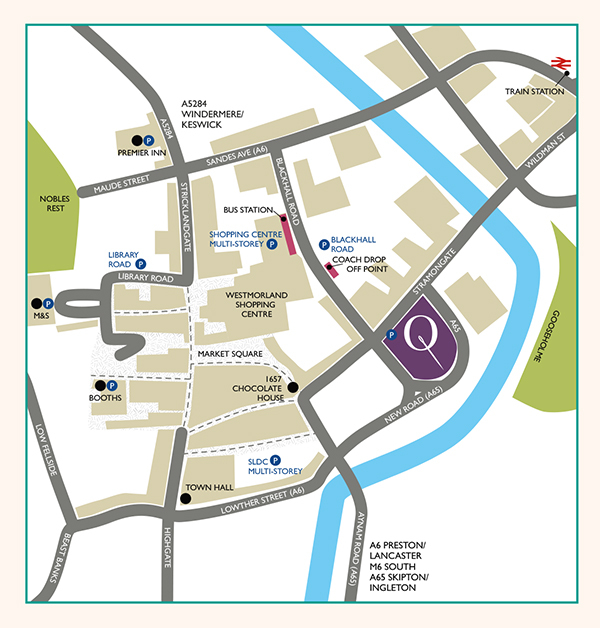 You can park your bike in the garden at the New Road entrance or in our car park at the Stramongate entrance. Our car park is small. It is only for the use of visitors to the Museum. We ask visitors to the Museum to kindly remove their car when they leave the premises to allow other visitors to park. If our car park is full the nearest car park is on Blackhall Road. See the helpful location map of how to find us if you’re on foot. During Museum opening hours 10am – 5pm the small car park is reserved for the use of exhibition visitors. Other users of the building, such as conference delegates, are asked to park at one of the nearby public car parks on either side of Blackhall Road 2 minutes walks away. The multi story is pay on departure, next to the bus station.